This portrait of a solitary African-American soldier brings the personal suffering and the deeper meaning of the Civil War into focus. The most destructive war in America's history was fought among its own people. The Civil War was a tragedy of unimaginable proportions. For four long and bloody years, Americans were killed at the hands of other Americans. One of every 25 American men perished in the war. Over 640,000 soldiers were killed. Many civilians also died — in numbers often unrecorded. At the battle of Antietam, more Americans were killed than on any other single day in all of American history. On that day, 22,719 soldiers fell to their deaths — four times the number of Americans lost during the D-Day assault on Normandy in WWII. In fact, more American soldiers died in the Civil War than in all other American wars combined. 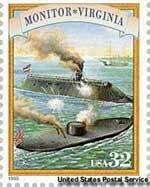 The naval battle between the Monitor and the Virginia (also known as the Merrimac) was one of the most famous of the Civil War, even though it was not a decisive victory for either side. The war was fought in American fields, on American roads, and in American cities with a ferocity that could be evoked only in terrible nightmares. Nearly every family in the nation was touched by this war. Scarcely a family in the South did not lose a son, brother, or father. Four long years of battle changed everything. No other event since the Revolutionary War altered the political, social, economic, and cultural fabric of the United States. In the end, a predominantly industrial society triumphed over an agricultural one. The Old South was forever changed. The blemish of slavery was finally removed from American life, though its legacy would long linger. Southern states began to leave the Union beginning with South Carolina in late 1860. The secession ceased when Virginia, Arkansas, Tennessee, and North Carolina joined the C.S.A. following the skirmish at Fort Sumter. In 1861, everyone predicted a short war. Most believed that one battle of enormous proportion would settle a dispute at least 90 years in the making. But history dictated a far more destructive course. "A house divided against itself cannot stand." I believe this government cannot endure, permanently, half slave and half free. I do not expect the Union to be dissolved; I do not expect the house to fall; but I do expect it will cease to be divided. It will become all one thing, or all the other. " Read the full text of Lincoln's House Divided speech, delivered June 16, 1858, at the Illinois Republican convention. 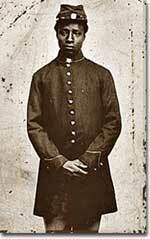 The Civil War was one of the earliest conflicts documented by the camera's lens. But did the photos of carnage always tell the truth? -William F. Testerman. Read this and other love letters home from Civil War soldiers. Robert E. Lee once said that without music there would be no army. Click the music icon and listen to a tear jerker from Ken Burns' series The Civil War.